Nothing makes me cringe more than seeing tack that was once nice lying in a dirty heap on the bottom of the tack room floor, piled high with dust and bits caked with dried hay and slobber. So, to avoid that disastrous scene, how and when should you clean your tack? Do you wash your dishes every time you use them? Do you enjoy eating off of a dirty fork? Do you like to go for a run in a mud-caked jacket? Tell me the last time you waited 2 years to wash your clothes. Is this starting to make sense? I hope so. Your horse does work for you. You should be doing everything you can to make that work comfortable! 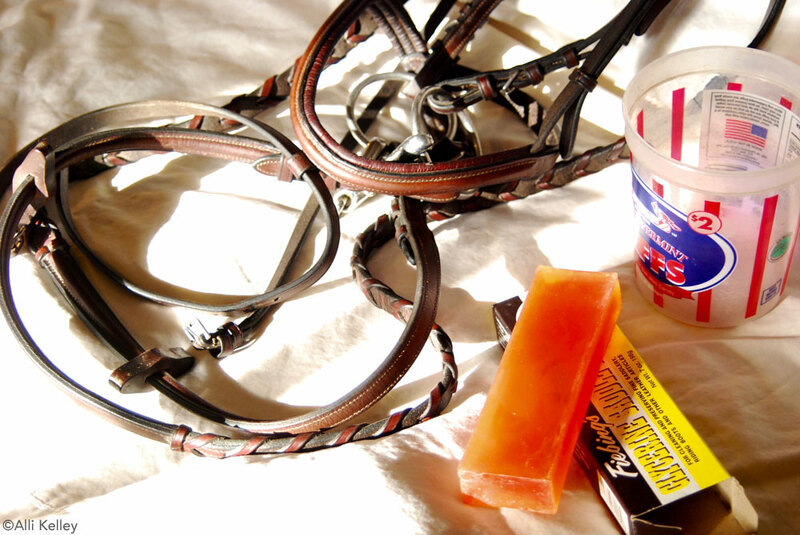 Here are some great tack cleaning methods for you to implement in your own tack room. For everyday cleaning, you will need a small bucket, a soft cloth, and some saddle soap. The kind of saddle soap you use it totally up to you, just be sure it is good quality. You’ll want to condition your tack regularly, but the frequency depends on where you keep it, the weather, and how old it is. When conditioning, just use your favorite leather conditioner and rub it in well with a soft cloth or just your fingers. You’ll also want to have a toothbrush and a toothpick handy to get in those hard to reach places on bits, bridles and saddles. Wipe the mouthpiece down with a damp cloth after every ride, scraping off any bits of feed. If you haven’t wiped it down in a while, let it soak for 15-30 minutes in very hot water and it should wipe clean pretty easily after that. If there is gunk stuck in the joints of the bit, use a toothbrush or toothpick to scrape it out. If your bit has rust on it, polish it away with a steel-wool pad, making sure to rinse and wipe it down very well afterwards. Wipe down the leather with a damp cloth (ring out as much of the water as possible) and saddle soap after every ride, paying particular attention to buckle pieces and areas that accumulate dirt. You can also partially unbuckle any straps to make sure all the crevices are clean. 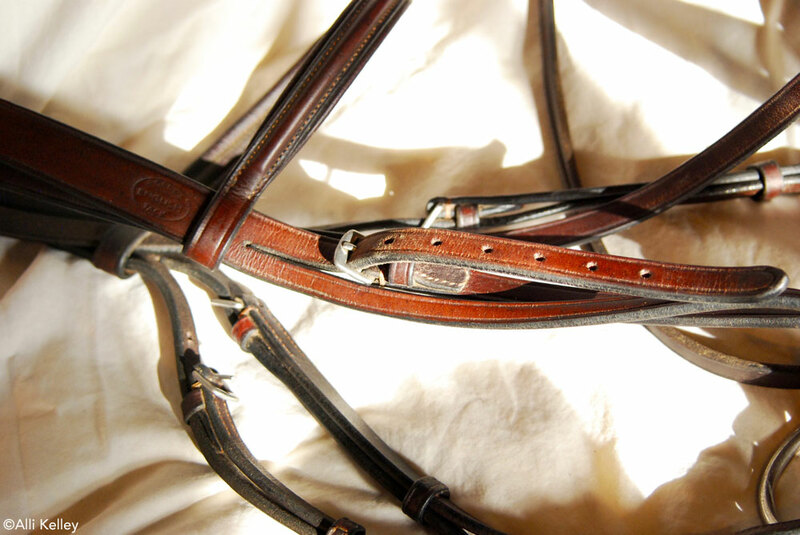 You should completely disassemble your bridle regularly and give it a really thorough cleaning and conditioning. How often you should disassemble and condition depends on how often it’s being used, the weather conditions it’s exposed to, et cetera. 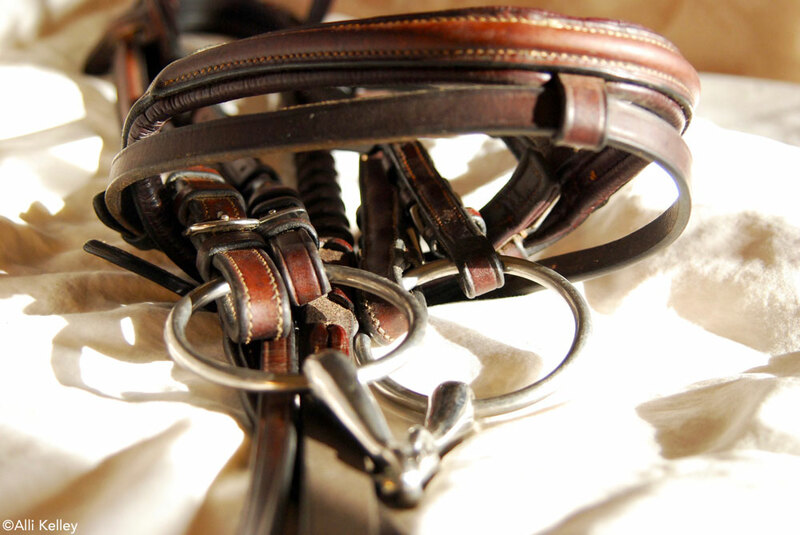 Give your tack a deep clean and condition before storing it for a long period of time. Make sure it’s completely dry before putting it away. Wipe your saddle down with a damp cloth and saddle soap after every ride being sure to lift up all the flaps and get in all the crevices. Deep clean your saddles on the same schedule as you do your bridles. If you notice tiny little dots of dirt building up under the flaps on your saddle, you’ll want to scrape those off. Using a putty knife can get this job done nicely, just be gentle so you don’t scrape the leather. These will stay away with regular cleaning. Take some time to polish any metal on your saddle, including your stirrup irons. There are a lot of products out there that work really well; find one that you like and works for you. Wash your saddle pads at least every couple of months. If your saddle pad has caked on dirt and hair you can’t get off – it’s been way too long! If there is a lot of hair on your saddle pad, you can gently run a metal curry down the pad to get off as much as possible before running it through the wash (for non-wool pads). Take some time to make sure there aren’t any small holes that need repairing or loose threads that need to be trimmed. Use a stiff bristled brush to brush off your horse’s boots after every ride. Be sure to pay particular attention to Velcro or buckles and try to keep those areas as clean as possible. For a thorough clean, don’t just throw your plastic or neoprene boots in the washing machine–that can be a little rough on them. One method is to use a top-loading washer as it’s filling up. When you are doing a load of barn laundry, let the water and soap fill up in the machine and than swish the boots around in there and rinse them in clean water. You can do the same thing using laundry detergent and water in a bucket. After they’re thoroughly rinsed, simply let them air dry. Leather boots should be cared for the same way you care for your bridle. If they are fleece-lined, be sure to brush out the dirt after each ride. If they are lined on the inside with any other type of material, wipe it down with a damp cloth. Polo wraps and other types of bandage wraps can go in the washing machine. To avoid a giant, Velcro mess, separate the wraps into groups of 2-3 and put them into their own mesh garment bags. This keeps them from getting tangled up. There you have it! All the dirty details you need to keep your tack clean and have it last for years to come! Thanks for the article. I use toothpaste on my bit to really polish it, making sure I rinse it well afterwards. 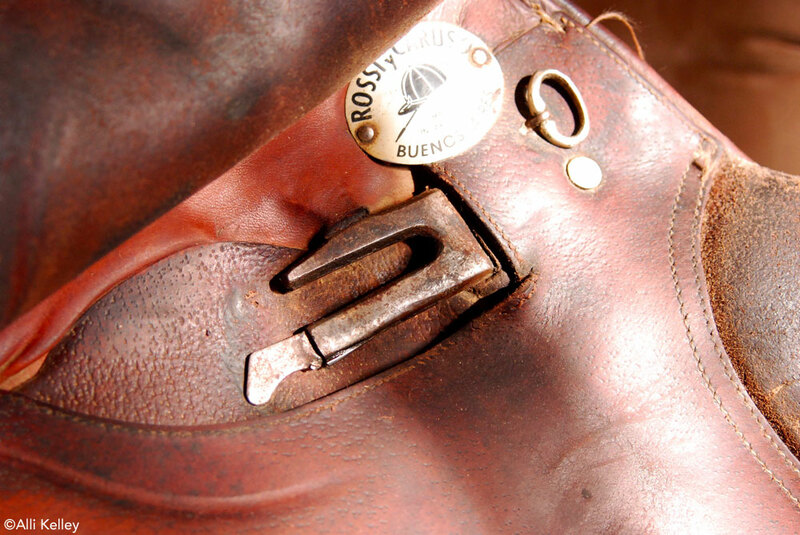 I really like the glycerine bar soap to clean the leather, like that shown in the picture. I bought my first and only saddle when I was about 23 yrs. old. It came from The Tack Shoppe in Calgary, Alberta, owned by Graham Ranches. It was a 17 in. Passier all purpose, they said if I looked after it it would last me a lifetime. At the time I felt like I had won the lottery ! I am now 78 yrs.and it still fits me like a glove and is in excellent condition as I did exactly as you suggested, granddaughter has used it in Pony Club and she also treated it with respect. Good article.